Customisation of legacy ERP applications is an expensive and complex nightmare of patches, regression coding, and headaches. It was never intended to be that way. The whole notion of customisation was born out of vendors’ desire to support a variety of business models. Every business is unique with particular IT needs. Businesses want the flexibility to tailor their systems to what they need. Workday chose a multi-tenant, SaaS-based approach and built a new system that overcame the legacy issues. 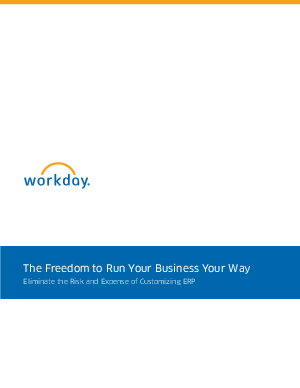 Read this whitepaper to learn how Workday can help free IT from the burden of maintaining legacy ERP.